Events with our partner schools promote an understanding of our culturally diverse community and exchange programmes contribute towards improved education. During 2018 we facilitated two significant outreach projects. 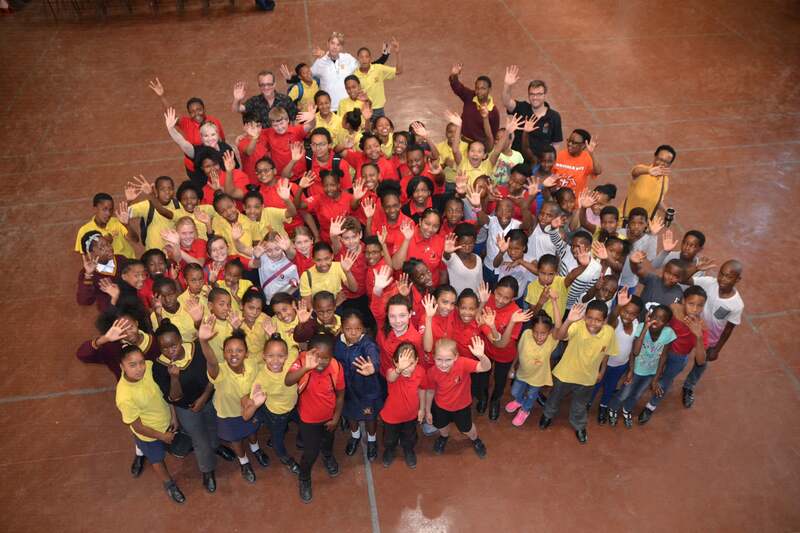 Our “Outreach Chor-Projekt” entailed the formation of a combined mass choir consisting of 150 learners from Grade 4 to Grade 7 from the DSP as well as two of our partner schools, Koos Matli Primary School in Mamelodi and P S Fourie Primary School in Eersterust and the World Choir Games Gold medal winners, the Bronberg Kinderkoor. “Our purpose was to promote the spirit of outreach as well as achieving an appropriate musical level with the help of the passionate Daleen de Kock who conducted the choir.” said Matthias Leeflang, Head of the New Secondary School at the DSP and coordinator of the project. Since March 2018 the learners rehearsed on a weekly basis at their respective schools. From 17 September they rehearsed together at the DSP with their efforts culminating in two concerts on 19 September in St. Peter Claver Roman Catholic Church, Mamelodi and on 20 September at the Johannesgemeinde in Pretoria East. Each school presented typical pieces of their culture, but the main focus was on performing together. The audience was entertained by the traditional piece Fürchte dich nicht in German, Johnny Clegg’s Asimbonanga to Dis ‘n land arranged by Johan Stemet and even Viva la Vida by Coldplay as well as the haunting Fight Song by Rachel Platten, arranged by Roger Emerson among others. “To hear the choir, to see the young learners devote themselves to the songs, to experience the teamwork among the learners all give me reason to feel optimistic about our youth and our country.” concludes Leeflang. On an annual basis we host a soccer tournament in cooperation with the German Embassy. In 2018 the tournament was held in honour of Nelson Mandela to celebrate the 100th centenary. 21 U14 teams of which 14 boys’ and 7 girls’ teams participated in the tournament. “The DSP is proud to host this inter-cultural event in conjunction with the German Embassy and we hope that this sporting tradition will continue to further nurture our young talent, promote team spirit and strengthen the relationship between the DSP and our partner schools.” says Leeflang. Previous PostPrevious Play. Learn. Create the future.